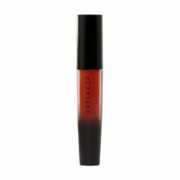 Nouba - Reflecta - 161Lip Gloss - 07"When light becomes 3D, matter gives life to extraordinary light games"Reflecta Treatment lip gloss, thanks to its formula rich in vinyl polymers and multi-reflecting micro-particles, shapes light transforming it in vibrant and fresh colors. Plumps the lips due to the presence of Maxi Lip. Available in three modern finishes: Extra brilliant, satin and transparent.